Everyone that reads this blog or tunes into our show should know my feelings on hidden role and social deduction games. It’s interesting to know that I didn’t always feel that way. 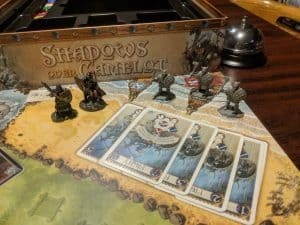 Like back in 2006 when I reviewed Shadows Over Camelot and through it was the best cooperative game I’d ever played. Let’s take a trip back in time for #ThrowBackThursday and check out that happier time in my life. Below you will find my original review with only very minor editing. I’m trying to keep the feel and tone of the original post. I’ve kept any pictures I used in the initial review as well. I will, at times, insert comments and you will find these in [square brackets]. After the original post, you can find my current thoughts on the game reviewed. No secret here. 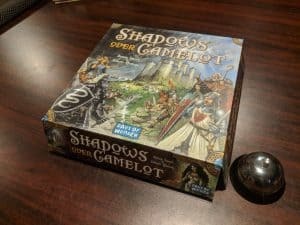 I grabbed Shadows Over Camelot because it was the next game I reviewed on the original forum after Agricola. 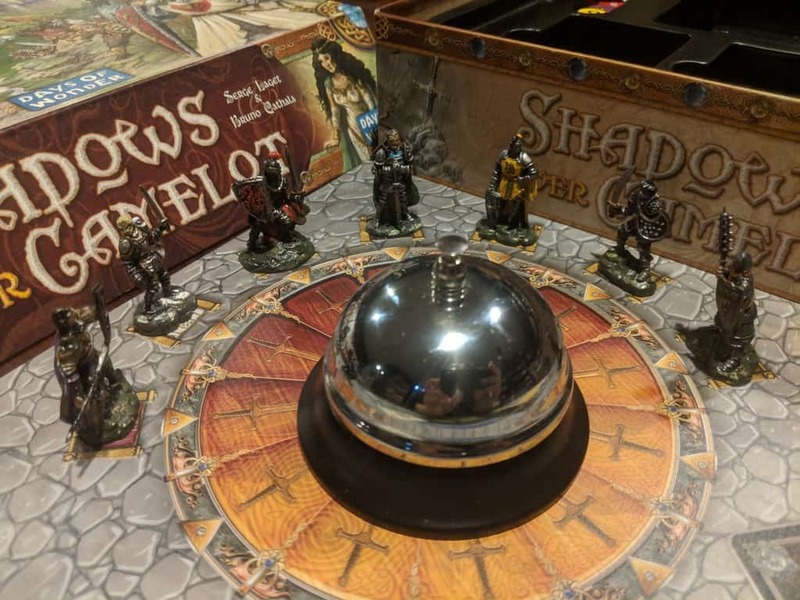 [In Shadows Over Camelot ] players each take the role of a Knight of the Round Table and embark on various Arthurian quests. Players work together to complete these quests in an effort to beat the game itself. Quests vary from jousting The Black Knight, battling an insane Lancelot, finding Excalibur, defeating a dragon [I really don’t remember a Dragon from any Arthurian tales I know], war with the Picts and Saxons, and, of course, The Quest for the Holy Grail. Play is simple, with a ton of strategy. Each turn you must advance the cause of evil and then complete a heroic action. Advancing evil is done by drawing a black card (which generally makes one of the various quests harder to complete, or something special and evil happens), by taking 1 point of damage, or by adding a catapult [to the fields in front of] Camelot. If the fields fill with catapults the game is over. Heroic actions include moving to a new quest, fighting catapults, playing special cards or doing a quest related event. The quest related events vary by quest. In Camelot you get 2 cards, against The Black Knight you must play 2 pairs of white cards, against the Picts or Saxons you must play a straight of white cards, etc. Each player knight also has a special ability (examples include, moving from Camelot for free, drawing extra cards, or getting to peek at the top black card). There is one final twist, there is a chance (a good one if playing with multiple players) that one of the knights is actually a traitor and they are working against you. Rules exist for accusing this traitor and if found that changes the way they influence the game for the side of evil. The game ends when Camelot is surrounded, all knights are dead or 12 swords are on Camelot. Swords are gained when quests are completed, black swords if the quest was failed and white if it was won. [If there are more white than black swords the heroes win. [If there are more black swords the game and/or the traitor wins]. This was a great game and a ton of fun. It is by far the best ‘team up’ game I have played. The components were beautiful, I haven’t seen a game this nice looking in a long time. Gameplay is very quick once you get into it. The game has a great feel of tension once it gets moving as you feel you are fighting a battle on multiple fronts (Picts and Saxons to the left and right, an almost full field of catapults in the middle and Lancelot looking too tough to defeat all at once for example). There is a ‘table talk’ rule that is awesome. Basically, you can discuss what you want as long as you don’t give away the value of the cards in your hand. This basically turns the game into a roleplaying session [where] players are saying things like “I will need assistance in the final hour in my war with the Picts.” This element really made the game for me. It would have still been a good game, but this rule and the resulting roleplay pushed Shadows Over Camelot up a few notches. The card mechanic made things random enough that each game we played felt very different. One game getting overrun by evil and the next being a closer fight. Advanced rules and variants exist for when you master the main game, to add more longevity to it. The plastic the figures of the knights are made of is odd. It’s a bit rubbery. This probably makes them more durable, but I wouldn’t consider painting them due to this consistency. [We found Shadows Over Camelot] confusing at first. [It] takes a few goes before you even understand what is going on. It’s really very different from anything out there. It’s not a pickup and play type of game. Really I can’t think of much else. This game is HARD! I guess you have to expect that for a cooperative game, but man is it hard to even come close to victory. I would say this probably gives the game some longevity. I don’t think our group will be using the variants that make the game harder any time soon. A great game, the best cooperative game I have ever played. The roleplaying aspect due to the ‘table talk’ rule really pushes this to the next level. The game is very different from anything else and will take a bit to learn due to that. Don’t expect to win this one the first time out (or the second or third time). Ah, the days when cooperative games were rare and the concept of a hidden traitor was brand new. I honestly think Shadows Over Camelot can be credited for, if not creating, at least making popular, a new style of tabletop play. While Pandemic has done more for cooperative games in general, I don’t think the team-based, hidden role, potential traitor genre, would be what it is without Shadows. There may be no Battlestar Galactica , or Coup , or The Resistance without this game. These days I don’t even consider Shadows Over Camelot a cooperative game. There are plenty of pure cooperative games out there and enough hidden traitor games out there that these days I consider them separate categories. 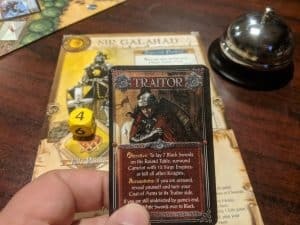 Though it is worth noting you can play Shadows without a traitor which is something I recommend for your first game when you are just learning to play. Who cares what genre it is right? So how do I feel about the actual game nowadays? I still dig it. I still have it in my collection. I will admit it’s been a while since I’ve played it but a lot of that has to do with just how much this game got played over the years since I wrote this review. It was a game I used to bring out to every single Windsor Gaming Resource event. The main reason for this (and something I missed in my original review) is that players can drop in and out of this game without ruining the experience for everyone else. Which makes it fantastic for playing at public events. Someone new shows up in the middle of the event they can jump right in and just start playing. Someone playing sees a game they really want to play that is about to start, they can just politely step away from Shadows and everyone else can continue playing. I don’t know many other games that do this (and actually can’t think of any off the top of my head). As for my complaints in the original reviews. My issue with the miniatures was basically unfounded. I never painted my own copy but I know people who did and never had a problem. Plus nowadays that flimsy cheap plastic is common. The minis in Shadows are significantly more study than most Reaper Bones Miniatures. The main reason I didn’t paint my minis is that Days of Wonder put out a set of prepainted miniatures called A Company of Knights. For some reason, these seem to have become some kind of Legend. Even the boardgamegeek entry has been deleted and now and then they show up on eBay as “Ultra Rare.” Guess I’m glad I bought a set when they came out. My other complaint was how hard the game is. That was just inexperience talking. Another reason I don’t play Shadows Over Camelot as often anymore is that I have played it so many times that I’ve basically solved it. I now know what needs to be focused on and what can be left alone. If I’m playing I find it very hard not to quarterback and just tell everyone else what to do. I now have a ridiculously high win rate on this game. Now here’s where the Traitor mechanic shines and I actually like it. With a group that does know the game well, being a good traitor as well as playing against a good traitor really does make the game more difficult and thus more interested. I also use the optional rule that Knights do not get their special abilities until they successfully complete a quest. Something else that ups the difficulty. One tip: if you are just starting, resist the urge to play without player powers to make the game easier to learn. Those player powers are hugely important in winning the game and I actually wonder if one of the reasons I found the game so hard back in 2006 is that I would skip over those rules when teaching in order to make the game easier to learn. Don’t make that mistake. Overall I still dig this game. I may not get it to the table often but it’s still great for public play and I still have fun every time it does actually hit the table. 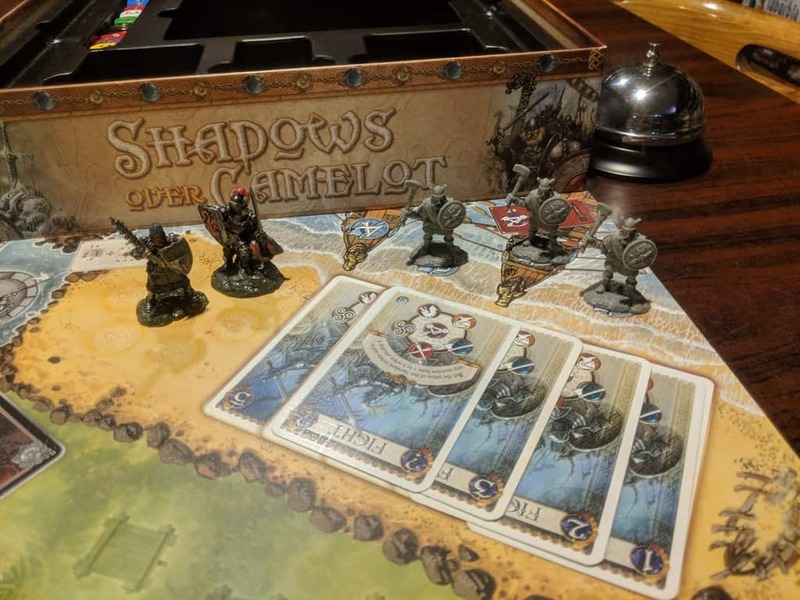 Have you played Shadows Over Camelot? What did you think?